^An unstable economy. A shaky stock market. Businesses facing huge financial losses. People losing their homes, jobs, savings, and...hope? ^ Is the sky falling in? Some feel that way. Is God still in control? Others wonders as they see and experience fallout from the greed and corruption that is seemingly pushing our nation to the brink of bankruptcy. ^ In "Lee Jenkins on Money," financial analyst Lee Jenkins answers questions about the nation's changing economy and other financial matters readers may be facing in the midst of this difficult financial climate. He helps them take a sober and responsible look at their finances and challenges them to be faithful stewards over what God has entrusted to them. Lee shows that by looking at life from God's perspective and applying biblical principles to their finances, readers bear witness to the fact that God "is "still in control and there "is" still hope. 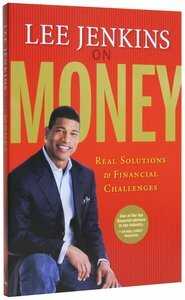 About "Lee Jenkins on Money"
Lee Jenkinsis a 20-year veteran of the financial services industry and is regarded by many as one of the country's leading financial advisors, educators, and strategists.On Wall Streetmagazine has referred to him as "one of the top stockbrokers" in the industry. He is president and CEO of his own investment firm, Jenkins Wealth Advisors, where he has managed up to 65 million dollars in client assets. His financial advice has been featured numerous times on local television stations and newspapers, as well as inMoneymagazine,Gospel Todaymagazine, and on CNN. In addition, he established Lee Jenkins Financial Ministries and Legacy Builders Financial Ministries, through which he teaches and trains people how to manage money from a biblical perspective. He and his wife, Martica, live in Atlanta, Georgia, with their three children. introduction: How Did I Get Into This Mess?